It’s been said that Mafiosos didn’t know to kiss each other’s cheeks until The Godfather showed them how, and perhaps the same thing could be said about the demonically possessed and The Exorcist. It’s certainly true that the cinematic portrayals of exorcisms root much of their DNA in that most famous horror movie, with modern special effects helping filmmakers achieve more horrifyingly unnatural demonic stunts as time has passed. The Rite is the odd little exorcism film that forgoes most of that, and strips away most of the drama and spectacle of an exorcism, treating the subject matter-of-factly. It’s an interesting and effective approach that works well for what is an entertaining and completely unremarkable PG-13 exorcism film. 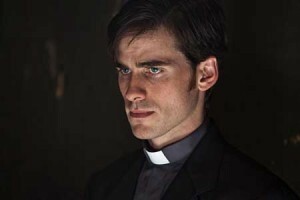 Michael Kovak (Colin O’Donoghue) is the son of a small town funeral director who has grown up around death and religion his entire life. As he enters adulthood his desire to escape the confines of his small town lead him to seminary- this choice is justified by the thin premise that everyone in his family is either a priest of a mortician, and that he can duck out of his vows after getting a four year degree if he chooses. Turns out that’s not the case, and four years later Father Matthew (played by the delightful and delightfully misshapen Toby Jones) informs him that avoiding his vows will turn his scholarship into a student loan. Having witnessed Michael’s spiritual capability as he delivered last rites to a dying car crash victim, Father Matthew convinces him to take a trip to the Vatican to train as an exorcist. 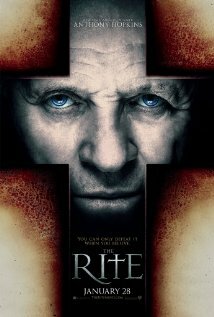 The movie really starts cooking when his Vatican instructor notices his skepticism and arranges for Michael to spend time with Father Lucas Trevant (Anthony Hopkins)- an experienced exorcist who can show him the real thing. The film takes great care to set up Michael and his path to becoming an exorcist in a believable manner, even if it does make it painfully clear that Michael is ultimately a believer looking for a good reason to believe. He’s quickly given the goods when he meets Anthony Hopkin’s character, who plays competent and cavalier entertainingly. This is no stretch of Hopkin’s abilities, but he’s energized here, and the material provides enough range that he can deliver important monologues (with that hesitant wisdom he’s so good at) and be a bit crazy in equal turn. There’s actually a fair amount of chemistry between him and Colin O’Donoghue, who sports a chiseled face that supposedly came out of Rutger Hauer (who plays his thoroughly creepy father). Father Trevant soon exposes Michael to his first exorcism- a routine demonic suppression that the priest has apparently been performing on a possessed pregnant girl for many weeks. This is where the film toys with the idea that exorcisms are not necessarily epic battles to banish a spirit in a marathon session of anguish and horror, but rather they are often long-term gradual sessions akin to therapy. “What were you expecting? Spinning heads and pea-soup?” Trevant asks Michael after his first taste of possessed girl who does little more than writhe around and talk with a smoker’s voice. This raises the question of whether or not these people are actually stricken with a religious ailment, but might instead need psychiatric care. It’s an intriguing conflict, but one the film never really figures out how to engage properly- especially when it’s so obvious our hero has to come around to believing at some point or another. The ending of the film pays-off this raised question satisfactorily enough, but it’s a very interesting idea that could have given the film an elevated texture, had it worked with it in any meaningful way. We get a sense of Father Trevant’s routine as Michael spends more time with him (never seeming to return to his normal vatican classes!) until finally the on-going struggle over the girl resolves and we enter the slightly darker end of the story, which sees the idea of demonic possession become closer, more personal, and much more difficult to discount for Michael. Somewhere in all of that time a woman, Angeline (Alice Braga) is introduced and says something about writing an important piece on exorcists- it’s never very important. Braga serves dutifully in an utterly useless role of a female face to, I dunno- be around sometimes. There’s nothing romantic about her relationship with our hero –Michael’s becoming a priest after all– and she has no particularly important purpose otherwise, so the role may qualify as one of the most shoe-horned female characters in a long time. As it avoids overwrought sequences of demonic terror, The Rite is more of a religious thriller than a horror film. It’s got scary moments, but none of the antics of the possessed are particularly unnatural. Special effects are limited and people don’t tend to float or do anything frighteningly inhuman, which plays into the idea that they might just need psychiatric help. The film is unwilling to maintain too much ambiguity though, and employs well-trodden make-up effects to make it clear that these people are not themselves. It’s a subtle but disappointing cop-out on the whole idea that this might all be farce. What we are left with is a desire to make these possessions realistic and routine, yet without enough mystery to make them unique. These decisions the film kind of inert- neither the themes nor the imagery are memorable. The one trick the film does have up its sleeve is extremely solid photography. Cinematographer Ben Davis (frequent Mathew Vaughn collaborator, before X-Men at least) brings some nice flourishes to the visual texture of the film, and does well in the darker, more closed in moments. You’ll notice his contributions right away from the delicate and intricate way he captures an embalming procedure. As the film nears its ending there is something of a twist but fortunately it’s not used in place of an actual conclusion, but more to create a worthy climax for the story. That said, I was baffled at the slightness of the ending. What is actually paid off is our hero’s journey towards belief and the resolution of said story comes through too much of a sudden “ah-ha!” moment to be affecting in any sense. Otherwise… An article on the events are published for the world, even though no great secret was ever purported to be hidden. A friendship is forged between Michael and Angeline, but there can be no consummation and distance will render it moot. A student is forced to battle for his teacher and dismiss his own doubts, and yet their final scene completely fails to acknowledge anything that’s happened. In fact, The Rite may have one of the most oddly unspecific denouements I’ve ever seen- it’s almost funny in its slightness. Frankly, The Rite is competent and entertaining, and does nothing monumentally silly. There are hints here and there of interesting thoughts and approaches, but ultimately it comes down to being a well-acted thriller with a fresh approach but small scope.